Palmate Newts look very similar to Smooth Newts but they have more of a preference for shallow ponds on acidic soils. They’re patchily distributed and found on heathland in the south and west and on moorland and bogs in the north; they’re quite common in Scotland, Wales and southern England but absent from much of central England. Palmate Newts can tolerate drier conditions than Smooth Newts and so can be found further from water. Identification Adults up to 9 cm in length. Smooth skin that is brown, green or grey.Yellow belly, often with dark spots. Unspotted pink or yellow throat (unlike Smooth Newts, which have spotted throats). During the breeding season males develop a filament at the tip of their tail and black webbing on their back feet. Distribution Native species. Distribution across the UK is widespread but patchy: common in Scotland, Wales and southern England but absent from much of central England and Ireland.Found across western Europe.Numbers thought to be declining due to loss of habitat. Ecology Preferred habitat is heathland, moorland and bogland. Preference for shallow ponds in acidic soils.Active during dawn and dusk.Feed on a variety invertebrate species.Very difficult to distinguish Palmate Newt eggs from Smooth Newt eggs. Greyish-brown or dirty white eggs surrounded by a transparent jelly capsule that is about 3 mm across. Eggs deposited individually on leaves of aquatic plants.Very difficult to distinguish Palmate Newt larvae (tadpoles) from Smooth Newt larvae. Light beige or brown, sometimes with fine black speckling. Larvae reach 30 – 40mm before metamorphosis. Predators and other threats Habitat loss. Adult newts emerge from their overwintering sites in early spring and head to a pond to breed. Males perform an elaborate courtship dance before the eggs are laid. Individual eggs are laid and wrapped up in the leaves of pond plants. At this time of year adult newts spend quite a lot of time in the water and will hunt frog tadpoles. Depending on local weather conditions, two to four weeks later larvae (sometimes called newt tadpoles) will hatch out. The larvae have feathery gills around the head, distinguishing them from frog and toad tadpoles. A couple of months after they hatch the larvae start to grow their front legs (again, different from frogs and toads), followed by the back legs. When they have absorbed their gills, they leave the water as newtlets (or efts), around August. Autumn is spent preparing for winter. Newts feed on various invertebrates. 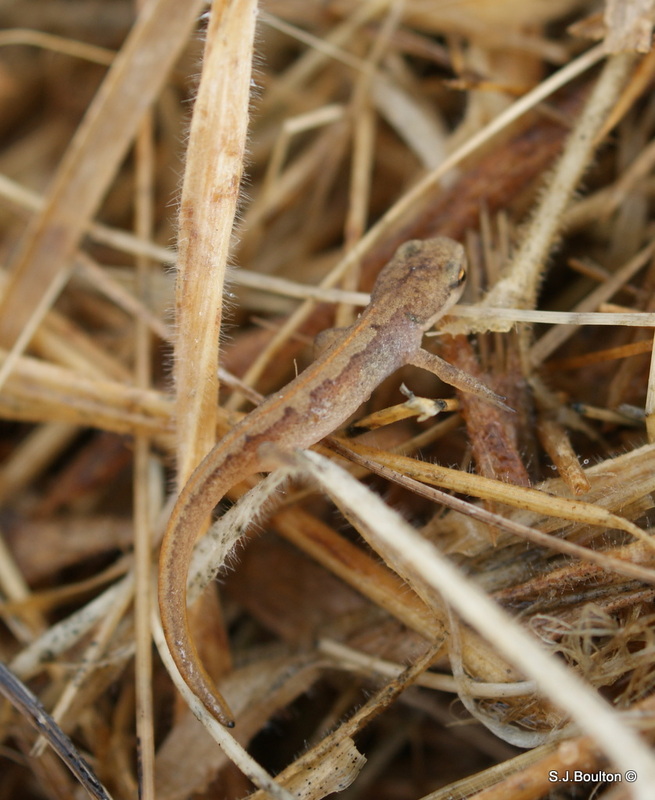 Palmate Newts spend the winter sheltering under rocks, in compost heaps or buried down in mud. They don’t hibernate as such, and may take advantage of milder patches of weather to come out and forage. 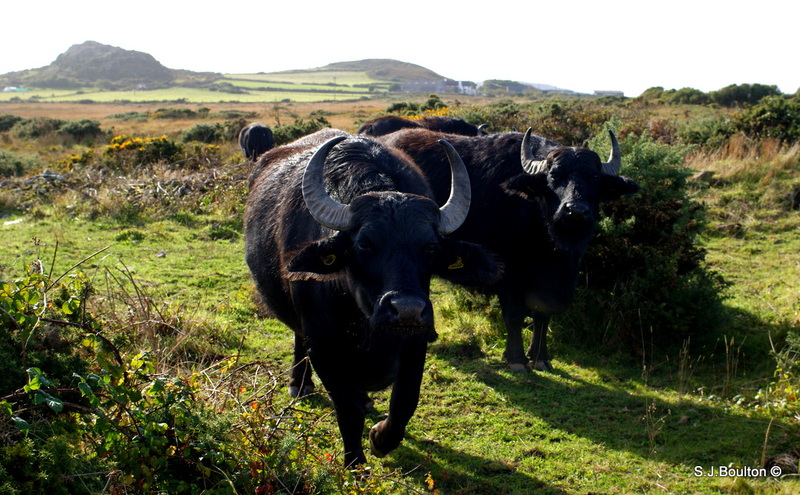 This is a National trust SSSI marshland which has become over grown so they have put in 5 Buffaloes to graze the boggy marsh land and bring it back into shape. It is this area I found several Juvenile newts.